Anyone know of areas in key west to detect? Not sure if this was ever posted in the forum, but here you go. Actually it is very well done and may help a few of the new wanna be hunters/potential finders soon to be on the Treasure Coast. Slingshot and NC Digger like this. 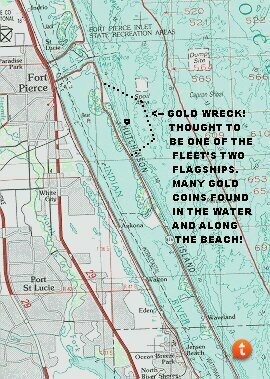 here is a field guide to the treasure coast shipwrecks with more complete information on the exact positions of wrecks and beach hunt sites. Last edited by Tnmountains; Oct 08, 2016 at 02:56 PM. Reason: Stop putting links in your post to items for sale. Are these coordinates for center, and north/south lease limits is still accurate, and if not, is that information available on one of the State websites? I was growing up and around the Fischer crew when they would come in on the weekends after dropping floats on mag strikes all up and down the coast. There are a lot more wrecks than you would ever believe. I remember where many of them were marked and made mental notes where they were. Now 40 years later I'm finally back, equipped and ready to have at them. So what I'm saying is if you got the Grand to blow go ahead, but the wrecks are all the way up the coast. There is just a concentration where they are letting you lease. You do the hard expensive work and they come in where you leave off and get the easy stuff. Thus the heavy record keeping. Old thread, but for what it’s worth, I received 3 pdf’s from the state showing current Treasure Coast leases from Cocoa to Jensen Beach. Nothing south of Jensen, but I doubt this is correct. By ivan salis in forum Treasure In The News!